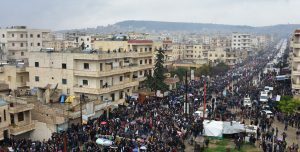 Citizens of Afrin protesting the Turkish invasion. Source: ANF news. Late last month, Turkish military forces invaded Afrin, an autonomous Kurdish area in Syria. This is a further step of escalating the involvement of the Turkish AKP government in the Syrian war and in its conflict with the Kurds. In the wake of the so-called Arab spring, the nationalist-religious AKP government decided, after some hesitation, to bank on regime change in Syria and to support Islamist forces in their neighbouring country. This engagement did not bring the desired results. On the contrary, the Assad regime proved to be relatively resilient and the Kurds managed to establish autonomous regions in Syria. This was an encouragement for the Kurdish-left forces in Turkey, and made the AKP reorient its strategy against the Kurds within Turkey. It finally led to the termination of the half-hearted efforts to establish contact with the Turkish-Kurdish guerrilla PKK and the search for a political solution in 2015. Instead, the AKP again banked on a military solution. It increasingly repressed the legal, left-orientated HDP with its strong Kurdish roots. In both of the 2015 parliamentary elections the HDP managed to cross the 10 per cent threshold for parliamentary representation. Involvement in the Syrian conflict and the authoritarian hardening in Turkey have gone hand in hand. The military invasion in Afrin is a very significant step in conflict escalation. Officially, the AKP government pretends that it is directed against both the Kurdish left military forces, the YPG and the PYD party as well the so-called Islamic State. The latter plays no role in the region. Thus, the real target is YPG/PYD that is closely linked with the Kurdish PKK. The YPG has established an autonomous canton jointly with laicist (secularist) Syrian forces. This left-wing autonomous administration is perceived as a challenge by the right-wing nationalist-religious AKP regime. The AKP has for a long time demanded the creation of buffer zones along its border. Now, it is trying to establish them by force. The Turkish military has deployed Islamist client forces grouped around the Free Syrian Army, as auxiliary forces. In this way, the AKP government tries to give its invasion in the neighbouring country a Syrian face. Nevertheless, the Turkish forces are perceived as a foreign occupation force in Afrin and in Syria more generally. It is a high risk operation for Turkey which might land its military forces in a protracted military conflict. Whereas Turkish and Western policies coincided initially in the aim to bring about regime change, the US government began to reconsider its position after the strengthening of the so-called Islamic State in both Syrian and Iraq. The smashing of the so-called Islamic State became a priority for both the Obama and then the Trump government. The Kurdish left YPG/PYD forces proved to be the most effective ground force in this campaign. The US government has viewed the engagements of Turkey on the side of Islamist forces in Syria increasingly suspiciously. Recently, the US government announced that it would support the creation of a 30.000 border protection force formed by YPG and laicist forces under the roof of the multi-ethnic Syrian Democratic Forces which would keep the Islamic State at bay. However, such a force would also imply that Turkey would by and large be isolated from the Syrian heartland. The Turkish government showed bewilderment at the US announcement. The Turkish government contacted the US before the invasion. “We’ve spoken to the US as well, but could not convince them”, declared the Turkish president, Recep Tayyip Erdoğan. So far, the US government has reacted very cautiously to the Turkish intervention, but Turkey’s step clearly creates further strains with the US and tensions within NATO. The Russian position towards the Kurds has been very ambiguous. The Russian government desires a closer re-integration of Kurdish autonomous areas into a Syrian state controlled by the Assad regime. The AKP government consulted Moscow before the invasion. Russia withdrew its military observers from Afrin directly before the Turkish invasion “in order not to expose the life and health of the Russian soldiers to risk”, as the Russian government declared. At the same time, the Russian Foreign Minister, Sergei Lavrov, underlined that the Kurds are to play a role in a political settlement for Syria and that they are invited to a conference on the issue in Sochi on the 20th and 30th of January. The Turkish invasion will escalate the conflict in Syria again and will further complicate a political solution in which Turkey wants to play a more important role. The invasion has consequences for domestic Turkish politics as well. HDP, small left-wing parties, human rights organisations and left social movements like Halkevleri have positioned themselves clearly against the war. Turkish security forces have clamped down immediately on protests against the invasion. The Turkish government threatened the HDP not to mobilise against the war in the streets. Many high ranking HDP officials, including its candidate in the last presidential elections, Selahattin Dermitaş, have already been detained for months and many of its mayors have been deposed. Many of the 1128 university academics who, in early 2016, signed a declaration against the human rights violation in the Turkish military campaign in Southeast Turkey and for a political solution to the Kurdish conflict, have been dismissed from university. In some cases, it was the universities themselves that fired them, but in many cases they were dismissed by law-decrees under the state of emergency. Since the end of 2017 trials have commenced against 148 signatories of the declaration, mainly those from Istanbul universities. The Turkish opposition has been divided by the military invasion. The heterogeneous CHP, the largest parliamentary opposition party, has come out in support for the invasion in Syria. Its nationalist wing is strengthened while its social and human rights orientated current, which has been a target of increasing repression recently, will probably be weakened. The ranks of the nationalist forces around AKP will be closed. The military adventure will distract temporarily from the delicate economic situation of Turkey. Like the autocratic regime in Saudi Arabia when it intervened in neighbouring Yemen, the AKP government externalises its domestic problems into a foreign military adventure. Both regimes have been long-term allies of the West. The question is how Western countries will react to the military escalations in the region. In the light of the escalating situation, military exports to Turkey have already been questioned. Joachim Becker is Professor of Economics and Business at Vienna University and deputy head of the Institute for International Economics and Development.